Here's an elegant wand designed specifically for the close-up entertainer. 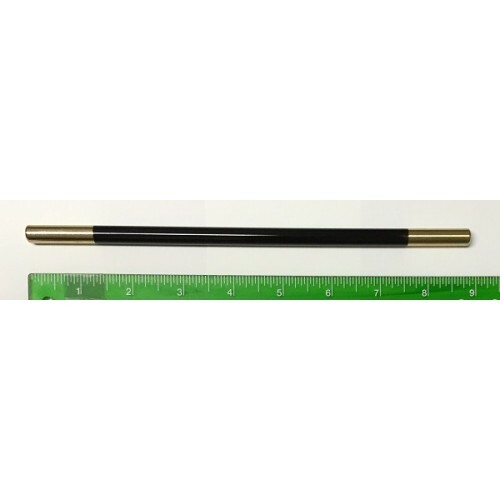 It measures only 9" in length and 5/16" in diameter. It is designed to fit into a man's shirt pocket without leaving a telltale "poke" on the breast of the jacket. Of course, you can carry it anywhere you want...including a trouser pocket! 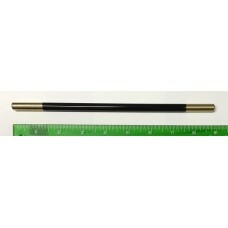 The body of the wand is crafted in shiny black delrin, with the tips being solid, shiny brass. and the tips are HEAVY.... believe me, if a spectator gets a little "handsy" with you, a quick rap on the knuckles with this baby will definitely set them straight! This wand was a complete sellout for me at the recent "Winter Carnival of Magic" in Pigeon Forge, TN. All I did was leave it on top of my demo case! People saw it, commented on it, and I handed it to them. THAT'S ALL IT TOOK! Once they picked it up and felt the heft, then examined the quality, they knew they had to have one.